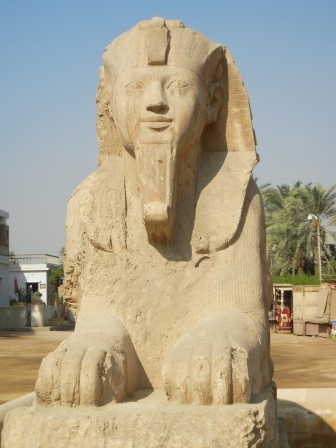 Sept 29 – Colossus, Pyramids and Sphinxes, Oh My! 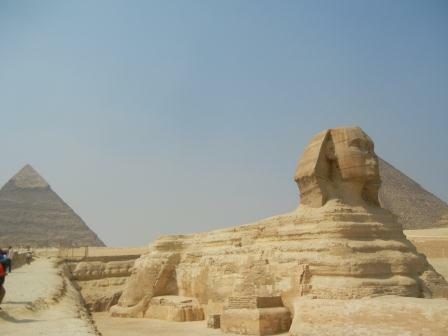 We met Ahmed and Dr. Fayed at 8:00 AM, got our bags packed into the car an took off for Memphis, Saqqara (Sakkara), Giza and the Sphinx. We drove to get to Memphis where they have the Colossus of Ramses II. At some point the legs on this massive Colossus were destroyed, so they have it lying on its back and this is enormous and kept in a building built for this purpose. Earl’s pictures on this link:https://picasaweb.google.com/105834752934496180032/Egypt do it justice, mine do not. Besides the statues of Ramses II, there were a lot of other statues around and through this trip between Memphis and Sakkara, we got to see much of the Egyptian small towns and farms. The black dirt on these farms is truly a contrast to the rest of what you see in the sands of Egypt. After Memphis we went to Sakkara or Saqqara (Sakkara is the translation on the street signs, but most books say Saqqara). This has a museum that we skipped, but also the famous “step pyramid” and the tombs. As we learned the “language of the deal” our guide was very well known and pretty much handed everyone at an entrance between 3 and 5 Egyptian pounds so that we wouldn’t have issues with taking pictures and seeing all of the tombs that he thought that we should see. These tombs in in Saqqara were really probably my favorite part of the trip. The carvings and vegetable dyes that were all original were beautiful and and it was amazing to think that they had been painted almost 4000 years ago! We also went inside of Teti pyramid and went down into it. This prepared us for seeing the need to duck, crouch and watch your step when going into the pyramid we went into in Giza. Definitely not for people who are not flexible, who are tall or anyone that has a chance of being claustrophobic. This tomb still has some of its carvings although the coffins have been removed. 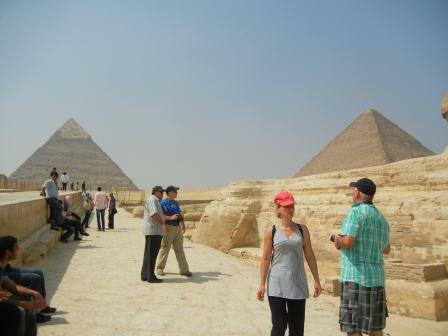 After Memphis and Saqqara, and a requisite visit to a carpet school; we were led onto Giza! There are actually 9 pyramids on the Giza site and 100+ pyramids in all of Egypt. The Great Pyramid is the grandfather, the 2nd is for the father and the 3rd is for the son. Entrance fees into the Great Pyramid (Khufu or Cheops -Greek name) are 100 Egyptian Pounds while for Menkaure was only 30 Egyptian Pounds. Since we had seen how uncomfortable crawling through the pyramids were we opted for Menakaure (Mycerinus). Khafre which is actually the medium size one with the limestone covering still on its apex, was closed. It is an optical illusion since it is on higher ground that makes it look like it is larger. 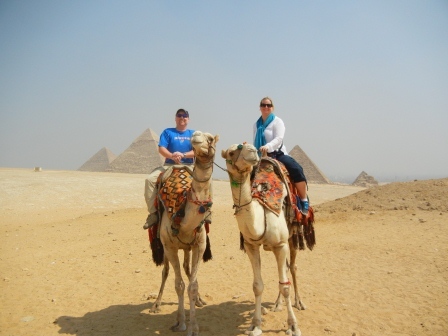 Since some days you just want a picture that shows you were in Egypt, we got camels to take us from the observation point to the base of Menkaure. This gave us both a good view and a chance to take a lot of pictures of the pyramids. I probably hadn’t seen Earl this excited for the whole trip and this was definitely a better camel ride that the ones we had in Abu Dhabi. 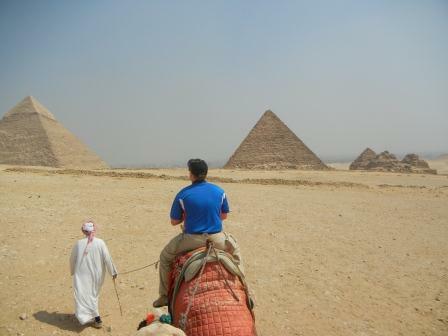 It was funny to listen to the Asian tourists squeal when the camel tried to get up, I guess most of them haven’t ridden horses for years and know to lean back on hills. 🙂 So, we got the wonderful typical tourist picture. After the 10 min trip across the desert and the camel guide said I was worth 10,000 camels (you can’t make this stuff up) we climbed in and back out of the Menkaure pyramid. Our guide through this definitely wasn’t afraid of making other people move out of the way for us. And we paid the appropriate Baksheesh (tip). This made me wonder if there was an actual monetary unit for “very happy”, as after we tipped they kept asking if we were “very happy” at after every experience. There were vendors everywhere at these sites who would sell figurines, post-cards, bookmarks, etc. So, it was very important that we stuck with our guide who would also keep us away from the other guides that wouldn’t take no for an answer and wanted to know if we had a hotel, a dinner, or take us to their “favorite” shop. On one hand this is very normal and really another way that these guides supplement their income and is something to get used to. So after the pyramids and Sphinx visit, we went to a government sponsored bazaar. Here I let Earl play his negotiation game with the gold and we got some more small items for people at home. After this whirlwind, Ahmed who was our guide’s son and served as the driver, we went to the Hilton Resort in “Dreamland”; which became really appropriate later. We got checked in and grabbed lunch while they finished readying our room. Then I got in took a shower and a long nap, since I didn’t really get much sleep the night before. I have some mixture of my normal insomnia, jet lag or time zone confusion that varies between taking an afternoon nap, sleeping really late or not being able to sleep at all. I think that is just a normal part of this round the world adventure. And again Earl’s blog post and album have many better pictures so please check that out!. Nice! How was the camel ride? Haven’t had one yet! Camel was cool and a bit cheesy. Make sure to negotiate a price and don’t feel bad about requesting a shorter ride which we did. Great pictures, Earl. Thanks so much for sharing them. I think we are all enjoying your trip. I love the picture where Jeanette’s camel is appears to be smiling. I think you are worth 10,000 camels, too. Don’t give her a big head Cheryl! no time for sleep…you will both need a vacation after your vacation!